Combustion reactions are reactions which involve oxygen gas and are exothermic. Exothermic reactions are chemical reactions in which energy is released in the form of light or heat. Combustion most commonly refers to the burning of hydrocarbons in the presence of oxygen gas. Combustion is a chemical reaction that involves a reactant and an oxidant which is typically oxygen, with products including heat and energy being produced. Combustion reactions are redox (reduction – oxidation) reactions in which the reductant and oxidant react to produce heat, energy and often flame. The reductant is referred to as the fuel and oxidant as the gas. In complete combustion there is sufficient oxidant for the reaction to occur. Combustion is not only important in our everyday lives in the production of energy, but also in keeping us alive. When the cells of our bodies break down sugar (glucose) to release energy they do so by a complete combustion reaction in aerobic cellular respiration. During aerobic respiration, glucose is combusted in the presence of oxygen to produce carbon dioxide, water and ATP (energy). A small quantity of heat is also generated in the process since this is an exothermic reaction. Complete combustion is often indicated by the production of a blue flame, and since all the reactants are completely burned, no smoke is produced which means that environmentally complete combustion is much cleaner than incomplete combustion in terms of pollution. Since all the reactants are consumed during complete combustion, a large quantity of energy is produced. An advantage of the products of complete combustion is that water is harmless and carbon dioxide can to some extent be taken up by plants for use in photosynthesis. Carbon dioxide also is not toxic to humans in the same way that carbon monoxide is. However, carbon dioxide can contribute to global warming if too much is produced, as plants can only use up so much which means that the excess stays in the atmosphere. Incomplete combustion occurs when there is an inadequate or insufficient supply of the oxidant, which may be oxygen gas. An incomplete combustion of a hydrocarbon with oxygen as the oxidant will produce carbon monoxide instead of carbon dioxide. 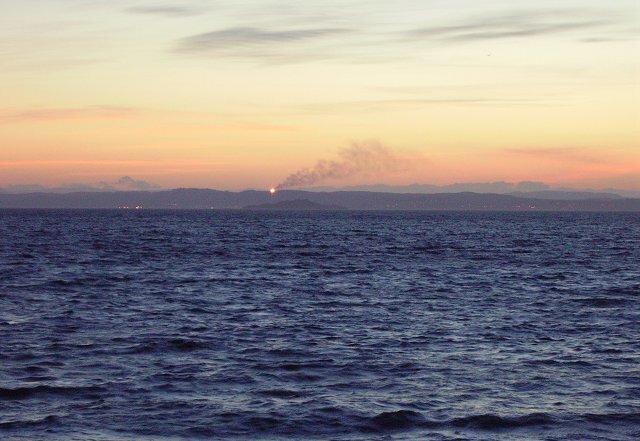 Incomplete combustion not only produces less energy than complete combustion but as can be seen from the example below, can produce toxic byproducts such as carbon monoxide (CO). Carbon monoxide is toxic which means that in many cases incomplete combustion is not what is desired. Incomplete combustion of a household appliance that uses gas can thus produce carbon monoxide which can reach deadly levels in a house. Carbon monoxide is dangerous since it is also colorless and odorless which means that people would not be aware until it is too late. Incomplete combustion is often indicated by the production of a yellow or orange colored flame. Not all of the reactants are consumed in incomplete combustion with the result that less energy is produced at the end of this reaction when compared with complete combustion. An example of incomplete combustion is the burning of coal in which soot and carbon monoxide are produced as a result of the chemical reaction. Smoke is produced as a consequence of incomplete combustion, which of course adds substantially to air pollution. The problem with incomplete combustion therefore, is that it exacerbates pollution levels and may contribute to health problems in people by causing respiratory problems. 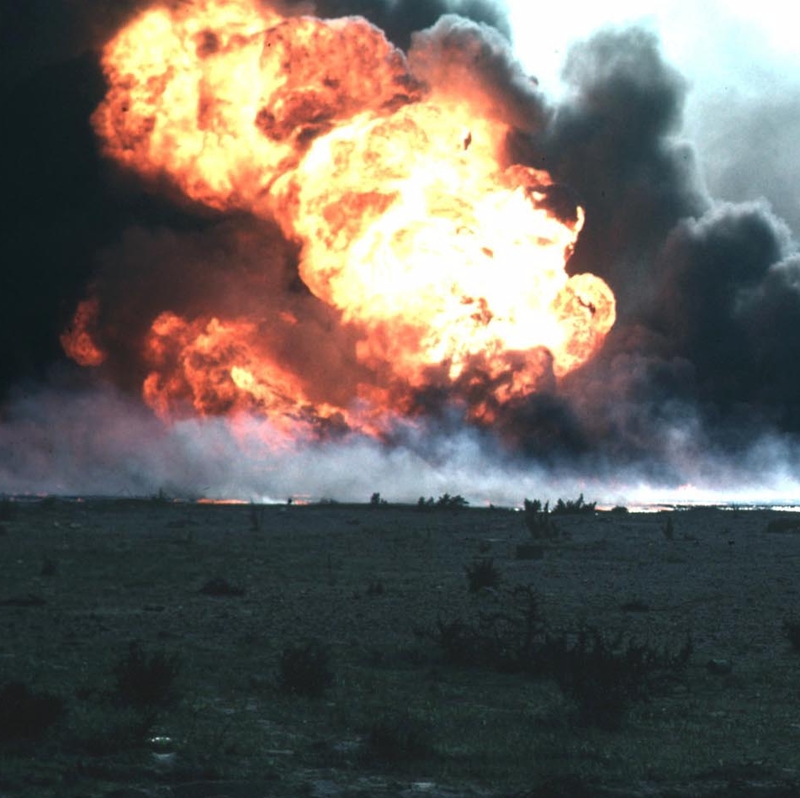 Complete combustion occurs when there is a sufficient and adequate supply of the oxidant, while incomplete combustion occurs when there is an insufficient and inadequate supply of the oxidant. Complete combustion of hydrocarbons will result in the production of carbon dioxide and water, while an incomplete combustion of hydrocarbons will result in the production of carbon monoxide and water. In incomplete combustion a yellow or orange flame is usually produced while in complete combustion a blue flame is produced. Incomplete combustion produces smoke as a result of the reaction, while complete combustion does not produce smoke as a result of the reaction. Incomplete combustion produces less energy than complete combustion because not all the reactants are consumed in the reaction, while in complete combustion all the reactants are consumed. Carbon dioxide produced by complete combustion can contribute to global warming while carbon monoxide and smoke produced from incomplete combustion contributes to air pollution. Combustion is the burning of, usually hydrocarbons, in the presence of an oxidant, which is usually oxygen. Combustion reactions are exothermic, releasing energy and heat. Complete combustion occurs when there is enough oxygen to completely use up all the reactants. Incomplete combustion occurs when there is not enough oxygen resulting in the production of smoke, and less energy is produced when compared with complete combustion. Both complete and incomplete combustion do produce products that can cause problems. Complete combustion produces carbon dioxide that adds to global warming while incomplete combustion produces carbon monoxide that is toxic. Incomplete combustion also produces smoke which contributes to air pollution. Combustion reactions are important in our everyday lives, even in how we produce energy in our bodies. Dr. Rae Osborn. "Difference Between Complete Combustion and Incomplete Combustion ." DifferenceBetween.net. 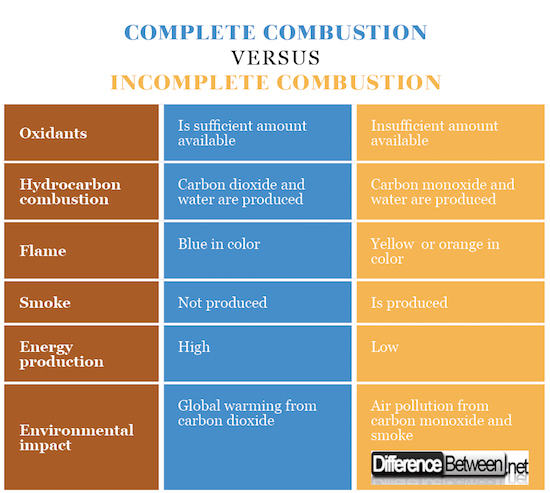 March 20, 2018 < http://www.differencebetween.net/science/difference-between-complete-combustion-and-incomplete-combustion/ >.